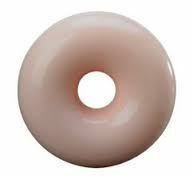 The Donut Pessary is used by women suffering from 2nd or 3rd degree uterine prolapse and cystocele. Donut Pessary is round in shape and made of silicone which is flexible and soft hence making it easier to insert and remove. It should not be deflated during insertion or removal and size should be measured by your doctor. Pessaries can help women avoid surgery in various gynaecological problems and other pelvic defects.